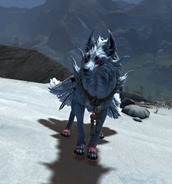 GW2 gemstore updated today with the Shrine Guardian Jackal available for 2000 gems and the Exalted Gloves from BLC chests. 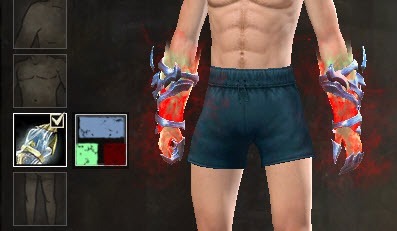 Exclusive to the BLC chest as an uncommon drop. Chatcode and image taken from that_shaman’s post. You can get the new mount skin from BLC, just used 10 keys.. got the Compas focus skin, new mount skin and Exalted gloves skin. RNG was never that good for me before. Btw they also put back the advanced cloth and leather racks. Yesterday the leather one was for 1000 gold, today for 300-400 so if you want to buy it now is the time, if you want to sell it like me.. well rip my friends we have to wait. No you can’t get the mount skin, only corresponded mini. Dude, I just got the mount from BLC. NO MINI, BUT SRSLY MOUNT. 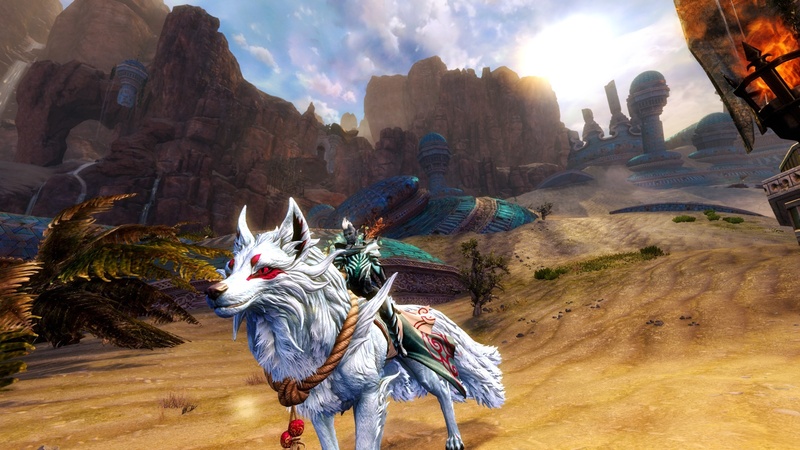 Yes I know they used to do the thing, where you get coresponding mini with current mounts being sold in gem store, but this time it really is a mount. It’s literally mentioned in the patch notes that the skin is an uncommon drop from BL chests. 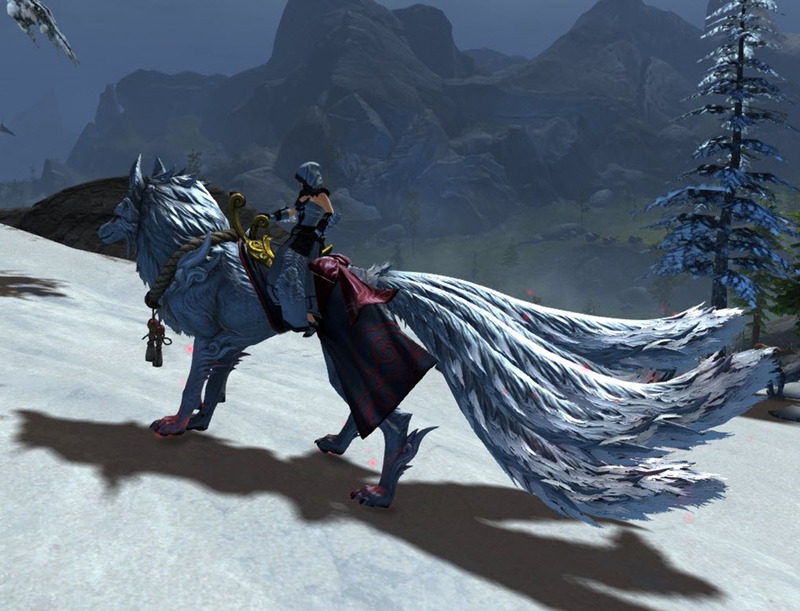 I can confirm the new mount being accessible from BLCs. Got mine that way, too. Instead of spending 2000 gems on one item, got the equivalent in keys and got that plus few other cool items. I’m all over that new logging tool. The kind of thing you didn’t know you wanted until you saw it. I need a Choya viciously chopping with a tiny axe. It’s got an axe to grind! too bad, I always use griffin for everything. They are not as fast as raptor on even ground travel only, but otherwise, tied or even due to flexibility and bird travel path on uneven terrains. If they wana head towards Oriental mystical creatures, when the griffin is reskined with say… a chinese crane or pheonix, i’m sure as hell to burn my wallet over…. That jackal <3 My poor wallet. It was fixed on log in tonight. 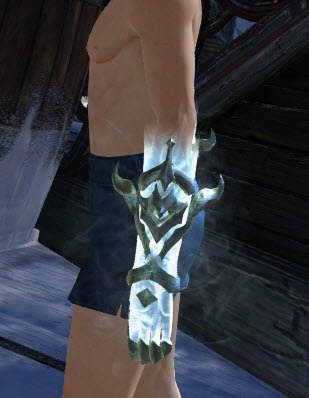 I see the Choya logging tool, and the first thing in my head is “MY ANACONDA DON’T-” ….Thanks, Youtube user Deroir. 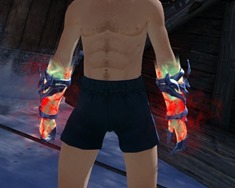 A little tough to colour the metallic bits on those Exalted Gloves. You have to really zoom in on them to see any difference in large swathes of dyes. 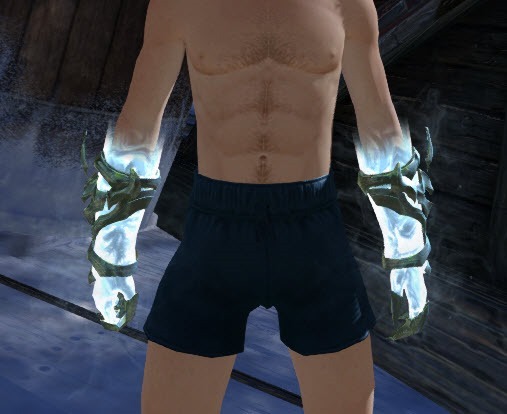 Nice, though — managed to get them just right on my necromancer. I really hope Gw2 carries on changing the Gem store more frequently. I also really like the jackal skin, I got it in a BLC chest, it’s really nice, I love the Japanese approach that Gw2 touches upon. Got Jackal skin from 1st key. But other 9 keys ….only common stuff. Was really hoping for those gloves..
Hailing all Stunning Quality Sci-Fi Fans o/ It’s also Educational Sci-Fi & best in many years. Join to today's Tweet Storm & tune in Live to watch today's The Expanse Episode. Tweet to @JeffBezos who is head of Amazon Studios & use max 2 Hashtags. Those written down below. They or one of other 2x will be included on today's Tweet Storm. Sign the Petition so we can reach 100k & beyond for next week when Sets start to go down. WTF, stop wasting space on our forums…. I ended up getting the Guardian skin from BLC from my weekly 5 free keys. I stopped buying keys four years ago, so it was nice to get it after my second key. It only took two years to get something nice again from BLC.